The other assembly is done by inverting the first. You assemble three units around a centre point and then five units around/ to form the hole. It’s a different form of assembly; my first wasn’t done intentionally. Half way through I understood that I was doing the “wrong” assembly but even so I finished it. This is the second one and I’ve done it with brighter colours so it’s much more to my liking! Both were done with wrapping paper cut in 7x7cm/ 2.75” squares. The blue has a diameter of 8cm/ 3.15” and the flowery one of 10cm/ 3.90”. 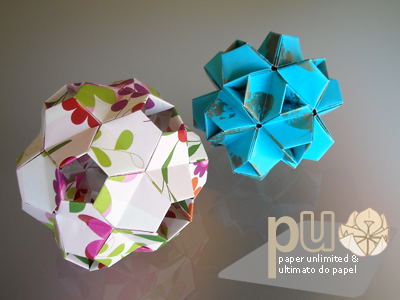 In the photos above you can notice that the assembly method changes the final size of the kusudama. You may or may not glue the units; I glued them because the paper was too thin and slippery but with stronger and a little textured paper you don’t need any glue. 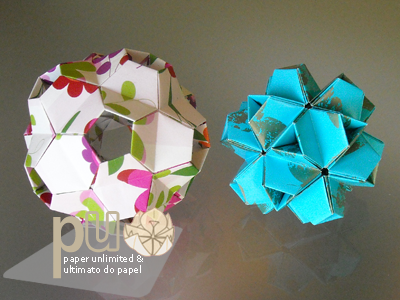 You have these two complementary assemblies in most, if not all, 30 units kusudama so, be attentive and experiment a lot! I want to try one more variant of this kusudama, with more units, but I still have a lot of kusudamas in my “waiting to be folded” list. Ah, vacation time will be great! 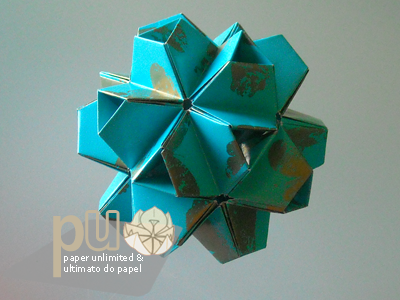 This entry was posted on 2010|06|21 at 19:22 and is filed under kusudama, kusudama (glued), modular origami, origami. You can follow any responses to this entry through the RSS 2.0 feed. You can leave a response, or trackback from your own site. May i ask where do you buy those amazing papers? These two papers are simple wrapping papers; they’re sold everywhere! As soon as I see a wrapping paper that I like, I buy it. 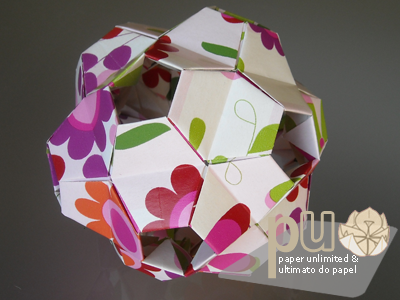 It’s cheaper than origami paper and still very colourful and easy to fold. 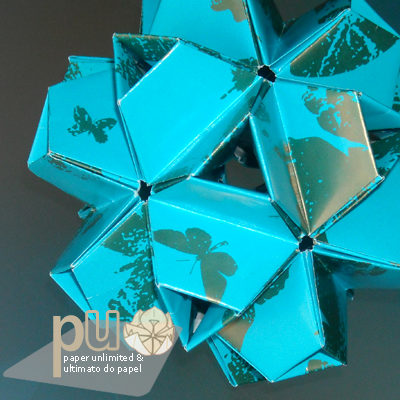 I want to tell you that this is by far my favourite origami blog… your models, papers & pictures are wonderful! Are you from Brasil? Which part? I´m from Chile… here we dont have many variety of paper, but there´s definitely more options with wrapping paper… thank you very much!!! I think no matter where you are there is always wrapping paper! I sometimes even fold from publicity paper that’s in the mail box… Some publicity is really good to fold. You can try that too. However origami and wrapping papers are my favourites. I went to the supermarket and got beautiful wrapping paper, and for free!! Thanks again Isa from Portugal!! !